"I really think this is going to transform oceanography by giving us a persistent presence in the ocean." Here’s a riddle for you: What’s nearly invisible, ubiquitous throughout the world, and produces at least fifty percent of the oxygen in our atmosphere while removing much of its carbon dioxide? The answer, you may not have guessed, is ocean microbes. We increasingly realize how much the world is run by the smallest of organisms. Yet we still don’t know enough about these microbes, nor how they influence large-scale events, like climate change. Now, a group of scientists is looking to autonomous robots for help. 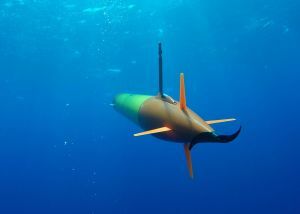 On March 10, oceanographers and engineers from the University of Hawaii Mānoa and the Monterey Bay Aquarium Research Institute (MBARI) deployed three long-range autonomous underwater vehicles (LRAUVs) in the waters off Hawaii. This was a test run, at least at first. Eventually, though, these vehicles will be able to autonomously travel and gather data for more than 966 km (600 mi) before scientists will need to recover them. Each LRAUV is designed with sensors to collect data like water temperature, chemistry, and chlorophyll content as it moves through the ocean, targeting large oceanographic features like eddies (swirling masses of water) and blooms of phytoplankton. What’s more, these robots can capture and archive samples of seawater in an Environmental Sample Processor (ESP) as they travel. The organisms in those samples will give researchers an idea of which kinds of microbes exist in different places in the ocean, and provide insight into the structure of the eddies in which some live, or which kinds of microbes live through algal blooms. The ocean has long remained an under-studied area of the planet. But vehicles like these are changing that — robots are mapping the seafloor, while floating sensors continuously gather information about the conditions in the ocean in general. “When we first talked about putting an ESP in an AUV, I thought to myself ‘this is never going to happen,'” said Jim Birch, MBARI’s lead engineer on the ESP project, in a press release. When MBARI researchers started developing ESPs about 15 years ago, they were about the size of an oil drum. The latest versions are one-tenth the original size, at 20 cm (8 in) to 25.4 cm (10 in) in diameter. “Now I really think this is going to transform oceanography by giving us a persistent presence in the ocean — a presence that doesn’t require a boat, can operate in any weather condition, and can stay within the same water mass as it drifts around the open ocean,” Birch added.